The backyard lawn is looking worn and tired, and you’re having trouble figuring what piece of rental equipment to use – the main suspects are gas-powered dethatchers and aerators. You’ve looked online and it’s kind of confusing – should you use one or the other – or both? Here’s the skinny on dethatchers, beginning with a differentiation between dethatchers and aerators: both are relatively heavy machines you use to reinvigorate tired lawns. They resemble each other, and deliver some shared benefits. Lawn experts generally say you should use each every couple of years, ideally in the spring or early fall. But dethatchers and aerators serve very different functions -- and neither is a substitute for the other. To put it simply, dethatchers remove excess organic debris from above the soil surface, and aerators clear out soil and roots below the surface. And they do so using different mechanical methods. The dethatcher basically whips the grass surface, and the aerator punches holes in the soil. Dethatchers attack the fibrous straw layer that's a byproduct of a healthy, growing lawn. But when thatch builds to be more than half-inch deep, your lawn can’t breath as well, or drink as deeply. 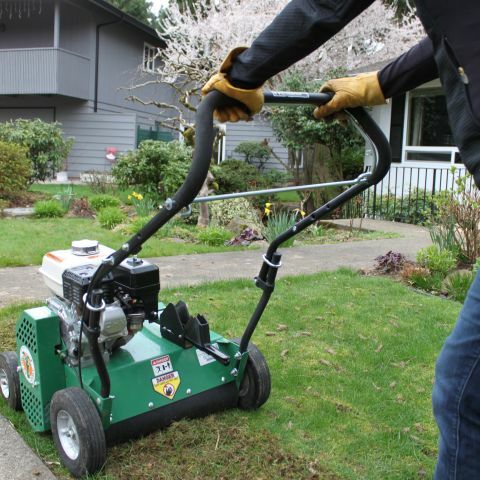 So you use the dethatcher -- also known as a "power rake" because it pulls and cuts out dead above-ground roots and stems that clog the arteries of your healthy lawn. Also, in clearing out the dead stuff, dethatchers make space for new grass to grow (Or, in wet climates like ours here in Portland, dethatchers can be vital to prevent the moss from taking over!). Beneath the dethatcher hood is a reel of flails that, when set properly, whip the thatch just a fraction of an inch above the soil surface. It’s pretty aggressive, and can cause damage to some healthy grass in addition to unwanted thatch – so don’t dethatch the yard just before your big backyard barbecue. For a little bit more on the aerator please visit our blog on the machine. For more on dethatchers, check out the videos, FAQs, preparation and use tips on our product page – heck, you download the detatcher operators manual if you really want to get smart about it !